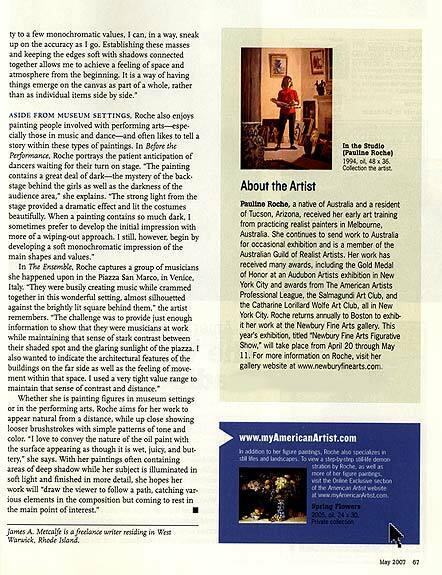 Some of Tucson, Arizona, artist Pauline Roche’s fondest memories are of visiting her favorite art museums and staring endlessly at the work of such masters as Rembrandt, Sargent, Degas, Manet, and Rodin. It is not surprising then, that many of her paintings are set in museums and focus on other people’s reactions to great works of art. “Capturing that feeling of quiet contemplation as an individual stands transfixed before a magnificent painting or sculpture has been a great source of inspiration for me,” the artist reveals. 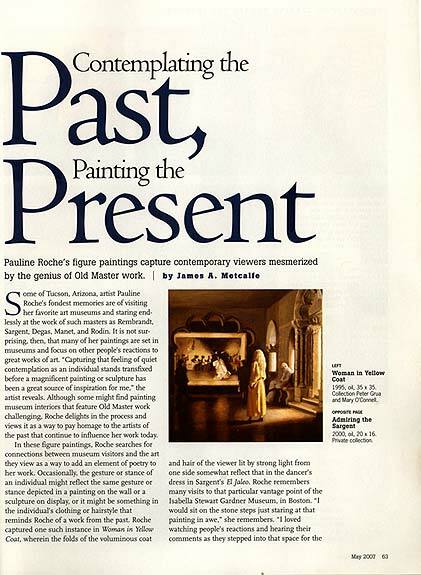 Although some might find painting museum interiors that feature Old Masters work challenging, Roche delights in the process and views it as a way to pay homage to the artists of the past that continue to influence her work today. Once Roche has made an initial statement on the canvas, she commits to darker darks and begins firming the shapes. “I make adjustments by adding less-diluted paint to build the darks and establish lighter parts by wiping out areas with a rag, which allows the white canvas to show through,” the artist describes. “This stage often feels rather like ‘sculpting’ the form on the canvas. 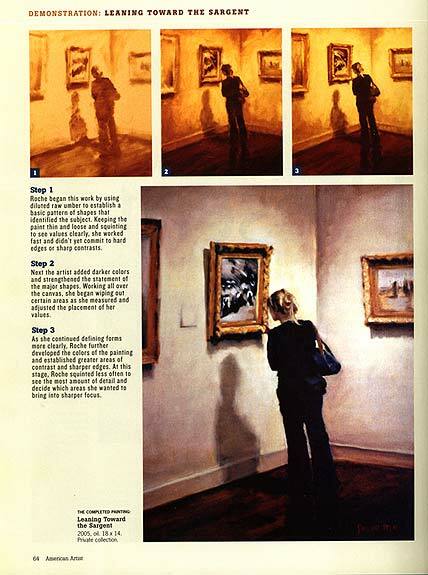 The result is a kind of black–and-white, unfocussed image that contains a soft preview of the painting. From this point, I have a rough map from which to move forward.” Roche then begins using color and develops greater contrasts and clearer edges wherever needed. “During the final stages, I selected which parts of the painting I wish to emphasize by pulling them into focus and creating a higher degree of finish to them. 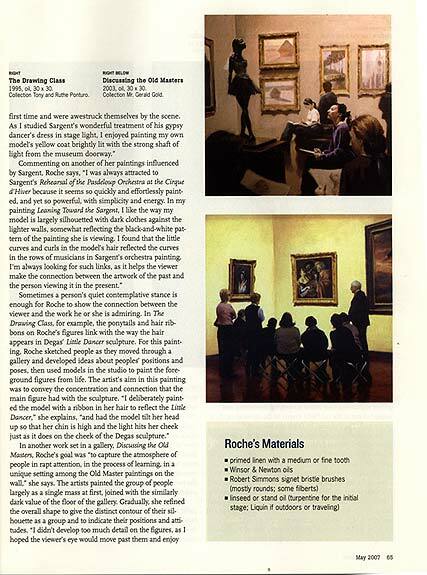 “The approach of softly developing areas of midvalue paint on the canvas, to me, is a much more manageable task than attempting to create a complete, accurate drawing from the beginning.” Roche admits. “By gently and softly massing in the simplified image, reducing all its complexity to a few monochromatic values, I can, in a way, sneak up on the accuracy as I go. Establishing these masses and keeping the edges soft with shadows connected together allows me to achieve a feeling of space and atmosphere from the beginning. It is a way of having things emerge on the canvas as part of a whole, rather than as individual items side by side. 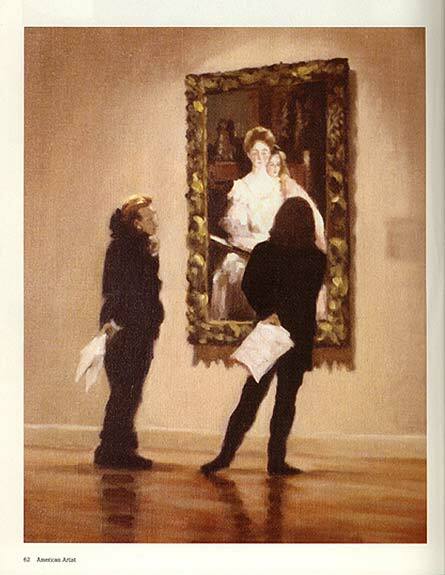 Aside from the Museum setting, Roche also enjoys painting people involved with performing arts-especially those in music and dance-and often likes to tell a story within these types of paintings. In ­Before the Performance, Roche portrays the patient anticipation of dancers waiting for their turn on stage. 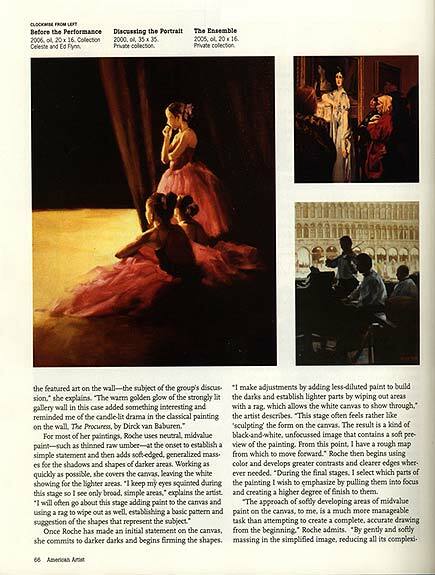 “The painting contains a great deal of dark-the mystery of the back-stage behind the girls as well as the darkness of the audience area.” She explains. “The strong light from the stage provided a dramatic effect and lit the costumes beautifully. When a painting contains so much dark, I sometimes prefer to develop the initial impression with more of a wiping-out approach. I still, however, begin by developing a soft monochromatic impression of the main shapes and values. Step 1 Roche began this work by using diluted raw umber to establish a basic pattern of shapes that identified the subject. Keeping the paint thin and loose and squinting to see values clearly, she worked fast and didn’t yet commit to hard edges or sharp contrasts. Step 2 Next the artist added darker colors and strengthened the statement of the major shapes. Working all over the canvas, she began wiping out certain areas as she measured and adjusted the placement of her values.